When I began my great book study, I never considered the benefit of reading theological works. I am certainly not interested in Christian fiction; however, historical, systematic, and personal testimony of great philosophers and teachers of the Christian faith do interest me. And since The Institutes was written by the John Calvin, in the 1500s, this title seemed fitting for theological classics. But to be sure that The Institutes of Christian Religion was or is considered a classic, I searched and found it often listed with Augustine's Confessions as an important work. Hence, I added it to my Classics Club list. 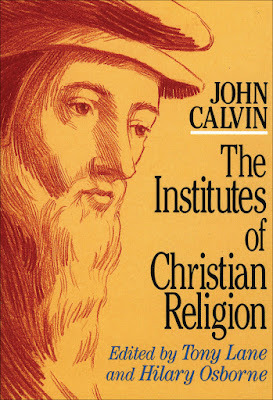 The Institutes was originally written in Latin by Calvin, in five editions, over twenty-three years. The entire final edition is over 1,000 pages. The edition I read was translated into modern English and contains only 15% of the text; the rest is said to be of little interest to the modern reader. Calvin wrote The Institutes as a simple handbook on Christian doctrine; a practical book about the Christian life. I struggle to know how to explain this book, so I labeled the parts, and within each section, I captured some of my favorite quotes or passages (in gray) so that you may better understand the voice of Calvin. And what can man do, man who is rotten to the core and so wretched, when even the angels veil their faces in terror? It is to this undoubtedly that Isaiah refers when he says 'The moon will be abashed, the sun ashamed; for the Lord Almighty will reign (Isa. 24:23). ...the only true faith is that which God's Spirit seals on our hearts. So because there is one faith, [Paul] infers that there is one God; and because there is one baptism, he infers that there is one faith. Therefore, if by baptism we are initiated into the faith and worship of one God, we must, of course, believe that the one into whose name we are baptized is the true God. And there can be no doubt that. The names we use to distinguish between the different persons of Trinity refer to the relationships of the persons to each other, not to their common substance or nature - which is one. This was definitely an essential section. Now, our duty is clear: since the Lord expects us to defend our lives, we must do so; since he offers his help, we must take it; since he warns us of danger, we must be careful; and since he supplies remedies we must use them. Sin and death were introduced by Adam, so that they might be abolished in Christ. So God begins the good work in us by arousing in our hearts a desire, love and study of righteousness. More accurately, he turns, trains and guides our hearts to righteousness. The Law is a kind of mirror. First by displaying the righteousness of God, it rebukes everyone for his own unrighteousness, puts him on trial, convicts and finally condemns him. Second,...the Law is to control those who would have no concern for just and right behavior, unless there was fear of punishment. Third,...the Law refers to believers in whose hearts God's Spirit already reigns. The Law acts as a whip, urging a man on like a lazy donkey! By [Jesus'] intercessions, he appeased God's anger, and on this basis created peace between God and men, and by this bond secured God's goodwill towards them. The metaphor comes from princes who have judges to who they delegate the job of administration and issuing commands. So Christ, in whom the Father is pleased to reign, is said to have been received up and seated on his right hand (Mark 16:19). All that the apostles mean when they refer to Christ's seat at the Father's right hand, is that everything is at his disposal. The Holy Spirit is the bond by which Christ effectively binds us to himself. The Christian ought to be disciplined to think that throughout his life he is dealing with God. Then he will bring everything to God for his assessment and use, as he looks only to him. We simply interpret justification as the acceptance with which God receives us into his favor as if we were righteous: this justification consists in the forgiveness of sins and the imputation of Christ's righteousness. ...justification is based on faith, not works. Good works done by believers are considered righteous, that is, they are imputed for righteousness. A work only becomes acceptable when it is received with pardon. "...and be spurred on to pray with real confidence of success..."
...if we are in communion with Christ, we have proof clear and strong enough to show that our names are written in the Book of Life. [Jesus] makes it clear that those who are rooted in God can never lose their salvation. When we are his, we are saved forever. Calvin describes the sacraments of baptism and the Lord's Supper. The one I did not agree with is infant baptism, which he says is totally acceptable if the parents are saved, since it is equal to circumcision, which was also performed on infants under the Law. I disagree because a believer must be mature enough to understand the gospel before he can repent and trust in Christ for his salvation. Besides, baptism is also a proclamation to the congregation that the believer is making a conscience decision to follow Christ. Infants cannot make this decision. And so that is my extremely minor summation of The Institutes, and still it was too long. Those who are curious or interested in reading about Christian teachers who have shaped our comprehension of God's Word and Christian theology, this is a simple and useful resource to use for your study. Great review! I just started reading it myself but I'm reading the whole thing.... almost regretting it... it's so long! Whoa, Lois! You are a champ! Good for you. I almost regret that I did not read the whole thing, but then I think it was beneficial for me to get a taste of it first. Maybe I will attempt it in the future. Looking forward to your review when it comes out. Btw, who is the editor of your version? I want to read this one day, but I'm working my way through the church Fathers now and going chronologically, so I started with Athanasius and I just finished Benedict. I'm trying to stay with main theologians because it could really take forever, but I'd like to insert Calvin when I get there. I can imagine that this was NOT an easy book to review. Brava, for accomplishing it! Cleo, that is awesome. I would have loved to do that - work chronologically through the great theologians. Yes, you will want to read Calvin. This book was actually super easy to read and comprehend. The Modern English was so simple for such complex topics. It is obvious that Calvin did not write this way. Now a real challenge would be to read it in its original Latin or even French. I began being interested in reading Calvin after reading a short work by Karl Barth and then Marilynne Robinson's Gilead. 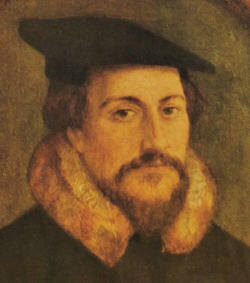 Robinson, in particular, mentioned that Calvin is quite mystical. This year, I want to read some version of the Institutes (maybe not the whole work) and the Augsburg Confession. This is a good size, just under 300 pages. I have the complete Institutes and I simply take a little bit at a time. It will probably take me a few years to complete it but it will be worthy it, it is so meaty with good theological teaching. I think it would be a great resource for one's theological library. Someday I'd like to read the original, but I bet it would take a long time.